I’ve been away from calligraphy for a little bit… As you can tell from the lack of posts I’ve put up over the years. However, I’m going to try to update this blog and maintain it a bit better, especially for those who aren’t on Facebook (click HERE to “like” Calligraphy by Kari!) or don’t follow me on Instagram (@karivandervelde). It will also give you the opportunity to see the progress in my projects. For the past several years, our family has been busy with international adoption, missions trips, kids’ sports, school, church, volunteering, and just generally getting used to being a busy family of 7. Calligraphy has had to take a back seat, but I’ve had some recent jobs over the last couple of months that have inspired me to get going and pick up my pen (or, in some cases, my brush or marker) again. 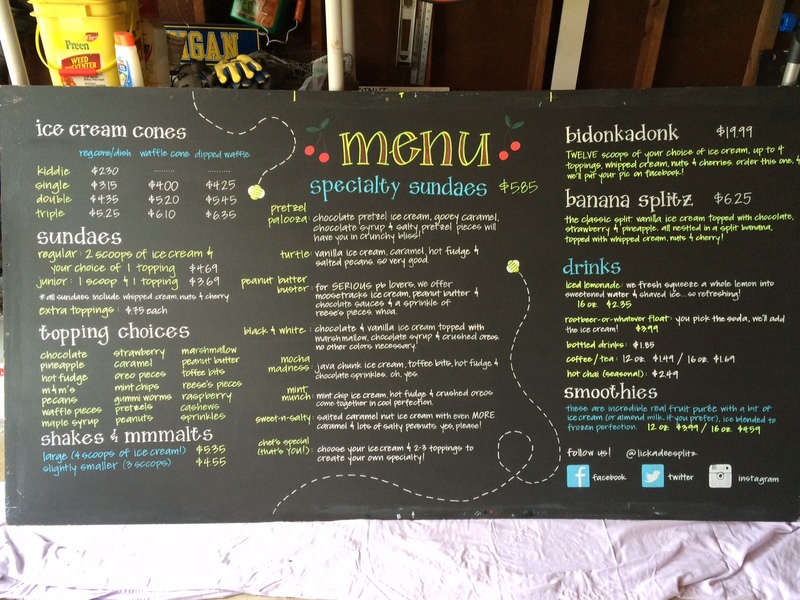 Here is a (somewhat) annual job that I have of either updating — or completely re-doing — the menu board for an ice cream shop up in Three Lakes, Wisconsin (Lick-a-Dee Splitz… if you vacation in the Northwoods, you need to stop here!). Over the years, I’ve done other work for Denise, the owner… Words around the perimeter of her stools, signage throughout the store, as well as creating a font for her to use around the shop. I even scooped ice cream one summer when we used to live up there. That was a fun job (hello, free ice cream!). It’s always been a pleasure to work on this for Denise. Her husband, Don, unscrews it from the wall of the shop, they repaint it, and then Don delivers it to me! When I’m finished, they transport it back up north (12 hours round-trip!). It’s fun for me to work on menu boards… something I don’t get to do as much any more. 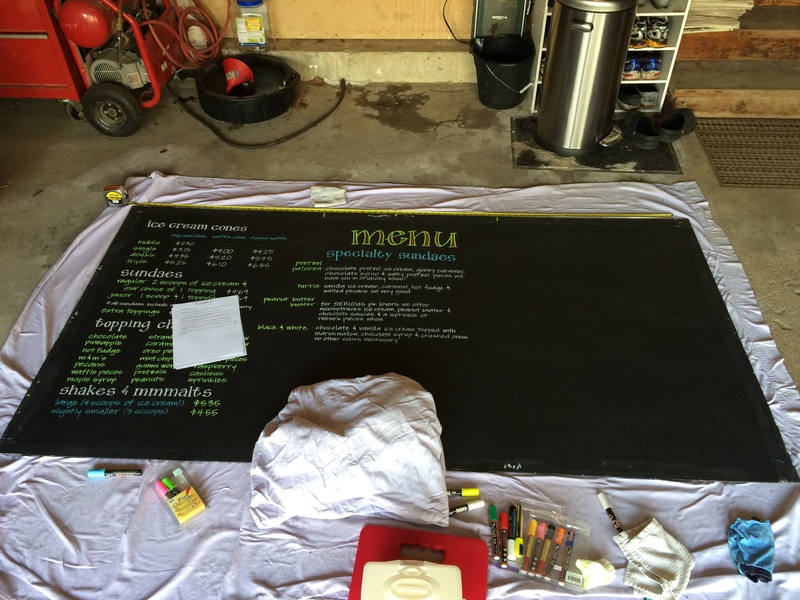 The menu board is so large that I had to work on it in my garage. I’m about halfway finished here. I’m almost finished with the words… And yes, I’m using a gardening pad to save my knees from the hard concrete floor! All done! I added a few bees, cherries and dots around the board to fill in the blank spaces. I added some social media icons at the bottom right. 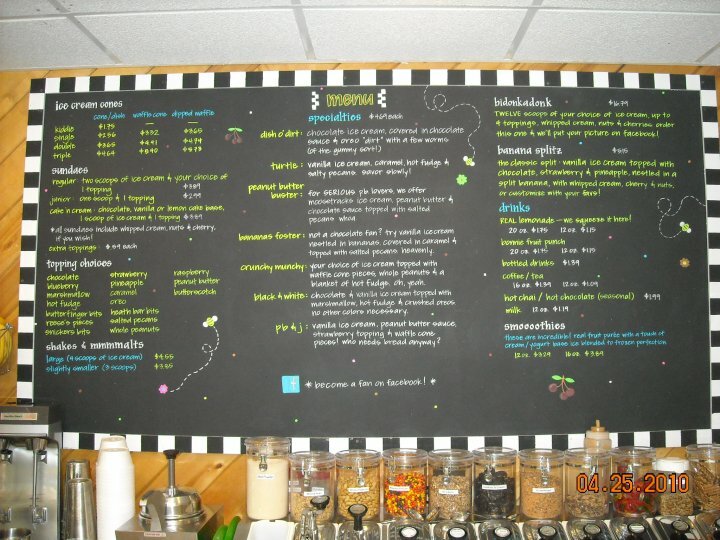 This was the menu board from 2010… It’s fun to see how the board has evolved! I’ve finished some more projects recently, and I will post them soon. If you’re interested in visiting Lick-a-Dee Splitz in northern Wisconsin during your travels, click HERE to go to their website, or click on the picture above or HERE to go to their Facebook page. You need to try the Three Lakes Mud Fudge… Outstanding! If you’ve ever thought about getting into calligraphy (and, perhaps, feel inspired from what you see here), try chalk! It’s not a large investment, and the pressure is low because you can simply wipe it off and try again. 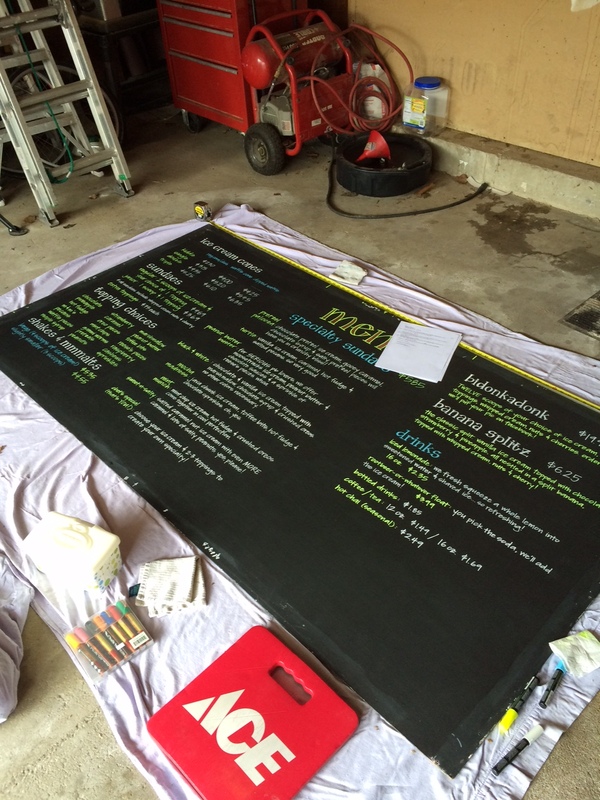 This menu board is painted with a flat chalkboard paint on plywood, so it does “eat” the tips of my markers after awhile, but there are many other types of surfaces to write on… Some even repaint thrifted mirrors to make into boards! In my experience, I’ve learned that the shinier the finish, the less the markers “ghost” after awhile (you know, the liquid chalk that has permanently seeped into the board that remains, no matter how hard you scrub). “Seasoning” the board (taking a dry piece of chalk and coloring the entire board, then letting it sit for several days or weeks) does help a little bit to prevent the ghosting. Dry chalk also tends to ghost less, but the words and images aren’t as bright. Check on Pinterest and Instagram for more inspiration… There are so many talented artists out there from all over the world! I’ve moved my site! It’s just easier to update a blog, rather than an entire website. For this busy mom, it works out really well. Thanks for joining me here! I am currently not accepting any new orders / jobs for the remainder of 2012. If you are interested in having me do some work for 2013, then feel free to email or call me, as my schedule is filling up quickly. Thank you! Like Calligraphy by Kari on Facebook!